The 18th edition of the 2016 Formula 1 Malaysia Grand Prix will have an added excitement for local fans, as two up-and-coming Malaysian drivers will be part of the main event as participants of the GP2 and GP3 Series. The announcement of the two drivers was sealed yesterday, following the agreement of the FOM to hold the GP2 and GP3 support races at the 2016 F1 Malaysian Grand Prix. 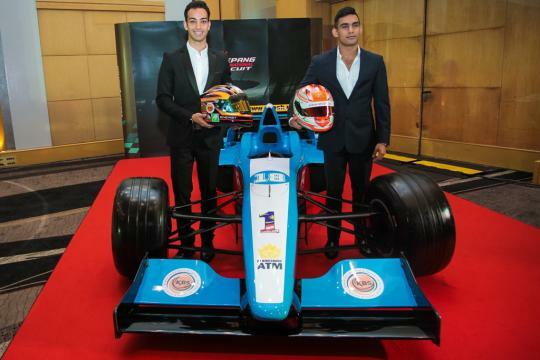 The two GP2 and GP3 incumbents are Nabil Jeffri and Akash Neil Nandy, who would represent Malaysia at the domestic rounds of the GP2/GP3. Nabil races for Arden International in GP2, while Akash drives for Jenzer Motorsport in GP3. Both series commence on 13 May in Barcelona, with 11 rounds and 9 rounds for the GP2 and GP3 respectively. All eyes will be shifted to the penultimate round of the series as the two incumbents take the track during F1 Malaysian round at Sepang circuit on 2 October. Nabil began his racing career at Asia Max Challenge (Rotax) back in 2008 and 2009, where he became the Overall Champion. He finished a credible 6th place in the Rotax Max Grand Finals 2009 in Sharm El-Sheikh, Egypt out of 72 drivers from 60 countries. He continued racing in the JK Racing Asia Series in 2012 and at the ATS Formel 3 Cup in 2014, both of which he finished 2nd overall. In 2010, Nabil was the youngest ever driver to test a Formula 1 machine. Nabil, then 16, conducted straight-line aerodynamic duties for the Malaysian-owned Lotus team at the Imperial War Museum runway at Duxford in the United Kingdom. Following a successful testing program in Barcelona and Jerez last month, Arden International confirmed that Nabil and Jimmy Eriksson have signed for the 2016 season. Nabil moves from Germany and European F3 where he has spent the last few years honing his skills and experience around the European tracks. Racing for Swiss-based team Jenzer Motorsport in GP3 this year, Akash is a rising star in his own right. He was recently awarded the McMillan Woods Rising Star Award 2016, in the Chequered Flag of the Year category. He began his career in 2010, kart racing at the Rotax Max Challenge Malaysia, finishing a respectable 2nd place. But his breakout race was when he finished a respectable 3rd place in the overall championship of the Formula Masters China Series in 2013. The wins kept on coming, as he almost won the Formula 3 Remus Championship in Europe, winning 10 out of 12 races. In 2013, at the prestigious Macau Grand Prix event, Akash, one of the youngest drivers that year, made motorsports history that same year after grabbing pole position, setting the fastest lap and winning in Formula Masters, when the highly respected season ended. Akash’s extraordinary talent won him an invitation to participate in the prestigious opening round of the Asia Le Mans Series with KC Motorgroup in 2013. Being the youngest driver to participate in a Le Mans Series, he walked into the history books of the event and Le Mans overall. Having qualified to start the race from P2, Akash steamed the team into P1 while closing his stint of the race, having set one of the fastest lap times and maintaining the position to finish as race winners. This year, Akash did his team proud by emerging overall champion in 1st place yet again in the GTM class on home ground. The 2016 Formula 1 Malaysian GP is scheduled from 30 September until 2 October; the venue was switched to end of season due to recent mandatory track resurfacing works. Sepang track usually hosts the second round of the Formula 1 world championships.